Questions about spa services or how you can enjoy discounted spa treatments today? Contact the Amenities Manager at amenities@thealaskaclub.com. Treat yourself to The Alaska Club's spa amenities, including massage, tanning, full body moisturizing treatments and much more! Available throughout the Network seven days a week. Available in Anchorage at South, The Summit, West, East, Eagle River, Wasilla, Juneau Valley and Fairbanks South. Choose the length of your session from 15-30 minutes. No need to undress. No oils or mess. Prepare muscles for cardio and strength workouts. Help muscles recover from strenuous exercise. Help oxygenate and detox the body. Increase muscle mobility. UV Tanning beds and/or hexes are available at all Club locations, except Jewel Lake. Transform your skin in just minutes. Bronze, hydrate & smooth fine lines in one session. Customize your tan with your choice of intensity and instant or time-released bronzer application. Experience a wide open design, EZ-2Breathe purification system & Comfort Dry technology, all in the privacy of an automated booth. Available at East, Eagle River and Summit locations. 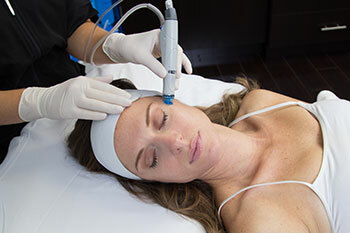 The following add-ons are designed to work in combination with your HydraFacial treatment. LED Red light therapy is used to reduce wrinkles and stimulate collagen production. LED Blue light therapy is suggested to help reduce oil production and control acne flare-ups. DermaBuilder™ helps smooth the appearance of fine lines and wrinkles, enhances skin elasticity, and helps even skin tone and texture while improving skin firmness. Britenol® Intensive Spot Corrector. This treatment works to rapidly diminish the appearance of brown spots and discoloration to restore beautifully healthy skin. This treatment goes a little bit deeper and will loosen the bonds of your dead skin, allowing new skin to grow. This can treat many skin issues such as acne and dry skin. To schedule an appointment for any service, contact a Reservation Specialist at 907-365-7393. Relax. Rejuvenate. Repeat. Tan & Massage Plus is a non-fitness spa membership to The Alaska Club.